Did you see our DIY chameleon clothespin craft we shared last week? 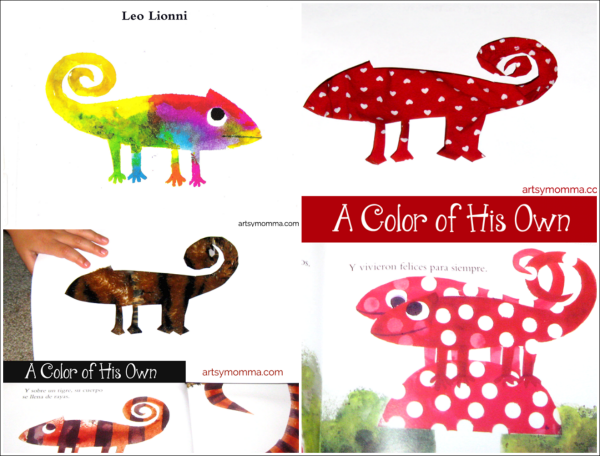 Here is another fun activity to go along with the popular kids book, A Color of His Own* by Leo Lionni – have fun changing the colors and patterns with a chameleon stencil! This color changing chameleon activity had my son giggling the whole time. *This post contains affiliate links to the products mentioned. Please read our full disclosure policy here. 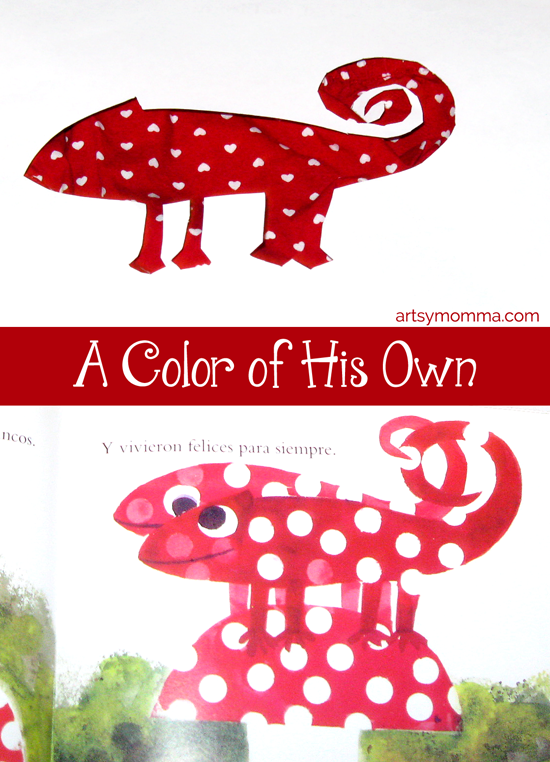 This cute kids story is about a chameleon who is sad that he doesn’t have a color of his own. All the other animals stay the same color while he changes depending on his surroundings. He attempts to stay one color by staying on a leaf. However, every season the leaves change colors and so does he. Eventually he meets another chameleon whom he becomes friends with. By staying together, they will always have someone the same color and they can change colors together. I would definitely recommend this cute kids book for younger children! Both my kids thought it was funny during the times/ages I read it to them. 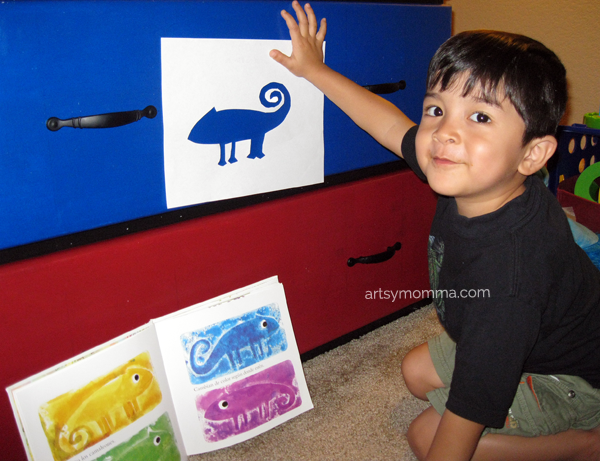 These photos are from when my son was 3 years old (now 7) so I’m not sure where I got the stencil from and may have even traced it, but here’s a chameleon template I found that you can print for free from TPT. Just print it and cut the stencil out (easiest way is to use a craft knife/exacto knife). I recommend printing on cardstock if you happen to have it. 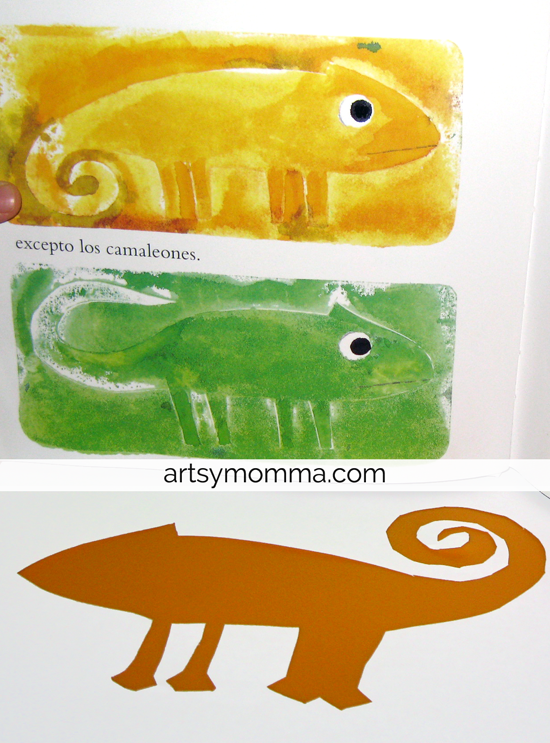 We reread the book and went around our home trying to make the chameleon look like the one pictured on each page. He had a blast finding the same color or a similar pattern such as stripes and polka dots. For the stripes, we found a stuffed animal tiger and for the red polka dot mushroom page, I found a pair of Baby’s Sister’s shorts that were perfect! 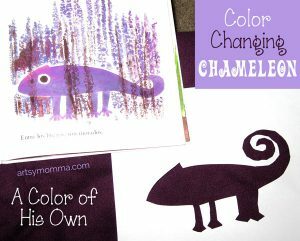 This color changing chameleon activity is a fun, hands-on way for preschoolers to see how chameleons camouflage themselves to blend in with their environments. 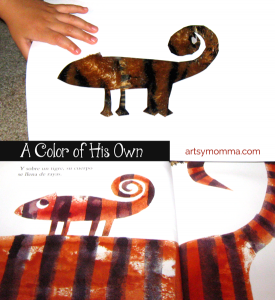 We are also fans of A Color of His Own and love your stencil idea – we think it would be great for kids to tell new stories about chameleons and creative play. When doing some research on chameleons to develop a related project, we learned that chameleons change their colors for reasons other than blending into their surroundings! Who would of thought, right? We were pretty stunned – that doesn’t change how great the story is or how much we love the stencils and want to use them! Thanks for inspiring us to dream up a related project!